THE LAST 8 MINUTES OF REHEARSAL: SHOWTIME!!! Make the Last Eight (or six or ten) Minutes the High Point of Your Rehearsal! Make a formal performance the last part of your rehearsal - complete with students entering, standing when you come in, playing through a work or section, bowing, acknowledging applause – everything that happens at the “real” performance. The sharpened focus that a practice performance creates can make the Last Eight Minutes (L8M) of some of your rehearsals their high point! There won’t be the usual loss of attention, eyes on the clock, restlessness, and gradual fraying of things; eight (or 7 or 10 or more) usually unproductive minutes will become highly productive. You and your ensemble actually give two performances at each concert: one is the music; the other is your musicians’ stage demeanor. Work with your ensemble on the L8M throughout the semester and they’ll be sharp and crisp onstage - something that’s impossible if students are told at the Dress Rehearsal “not to talk” onstage. ...try it out a few times, and you’ll see how powerful t can be in so many ways. The focus and engagement the L8M creates actually adds time to your rehearsal by increasing engagement and focus. Also: stopping the regular rehearsal early for L8M may make your rehearsals more efficient. Makes use of each and every minutes of your rehearsal. Knowing the L8M is coming may make them work harder in the rest of the rehearsal. Sets up the next rehearsal as students self-assess and prepare agenda. Work with your ensemble on the L8M throughout the semester. Rehearsing stage demeanor throughout the semester - not as an afterthought at the dress rehearsal - will create an ensemble that looks as good as it sounds. When they get to the performance, students’ minds are anywhere else but on stage demeanor; they’re thinking about: tough passages, the uniqueness of the situation, who’s in the audience, how sharp they look, etc. The L8M builds engagement by 1) working toward a tangible goal, not a distant concert, and 2) through the force of ceremony. Creates precision and alertness. Bringing instruments up together, and standing up and sitting down together creates a positive mind-set and superior musical results. It’s the same thing as getting execution into the muscle memory. Audiences are more attentive when an ensemble looks smart and snappy; that demeanor can impress even more than the music. Parents’ appreciation of you and your program will grow, as in: “Why can’t s/he look like that all the time? !” Some will be more interested in their discipline than their playing. Create a step by step, three stage protocol. Rehearse one stage at a time. You’ll know when to move to the next one. The following is somewhat detailed, but you’re already familiar with everything. Stage 1: The Ensemble and You Come Onstage. Have your ensemble go “off stage” - into the hallway - or to the sides of our room - and line up in the order they’ll come in. You, too. This may be a bit tough to control at the beginning, but novelty and the power of ceremony will, sooner than later, make this happen in a heartbeat. Moreover, it’s a lot of fun, engages them, and livens things up in the challenging last few minutes of the rehearsal. Depending on which side you come in, the musician who can best see your entrance nods to the concertmaster, who stands up; the ensemble follows. Rehearse this from the side of your entrance at the performance. No one is to look offstage at you (the back rows will until you train them not to. This is a great opportunity to create rapport and make personal contact with musicians who sit in the back, and who frequently feel neglected). Repeat this step until it's eally great; they’ll become more engaged, and actively enjoying the exercise. This is truly the case; you'see. You come in. Your ensemble stands, no one talks or touches the music. Sections that sit facing the conductor turn out to face the audience. It’s a nice gesture for conductors to stand with the first row of your ensemble. Standing with your musicians sends them the message that your heart is with them. It’s much better than coming up, jumping on the podium, and bowing to the audience. Do make a big deal of honoring your ensemble. When you reach the podim, bow first to the musicians (as a result of your work with them, they should be applauding you or shuffling) and only then to the audience. Shake your concertmaster’s hand (Make sure the concertmaster has her right hand free) Chorus Directors: do adapt this to your choral routine. Every time it’s not together (which will be most of the time at the beginning), get them up again and let them groan! They’ll love it. Anyone who doesn’t do it right will smile in embarrassment and the ensemble usually calls out their name in mock criticism. This creates total engagement. 11. When it’s close to being right, nod, smile and give them a thumbs up. You raise your arms, they raise their instruments. This (their bring their instruments to playing position, or whatever it is that choral people do) will need to be drilled, just like a difficult musical passage. Don't go one until they all do this as one. This is another access point for fun, and increased engagement and rapport with you. Have them do it great, once they do it great, then have them do it lazy; ask them if they feel a difference. Stop after they’re sung/played some of a piece (unless you’re rehearsing “playing it through (22 pp __-__). Pretend the piece has come to a close. They keep their instruments in playing position until you drop your arms. They then stand to acknowledge the applause; you stand with them, then go to the side of the podium, bow to them, bow to the audience, and get back on the podium. If there are two students on a stand one takes the piece they just played and puts it in the back of the folder. The next piece should then be ready since the music has been put in rehearsal order when they came in. Practice this until it's smooth; do it with smiles and good humour. Musicians stand, do not talk, smile. Maybe play the beginning of a work...or a bit more. You've finished the last piece. Motion for your ensemble to stand, shake the concertmaster’s hand, and blend into the ensemble as the audience applauds. Bow to your musicians first, then the audience. You go out, and Concertmaster sits the ensemble down. Return quickly to the podium, or (I prefer) stand next to it. Again, you bow to the musicians, then to the audience, and go off. Concertmaster seats the ensemble; s/he then gets up and signals the ensemble to leave the stage. Musicians go offstage in reverse order of how they came on – this must be orderly. 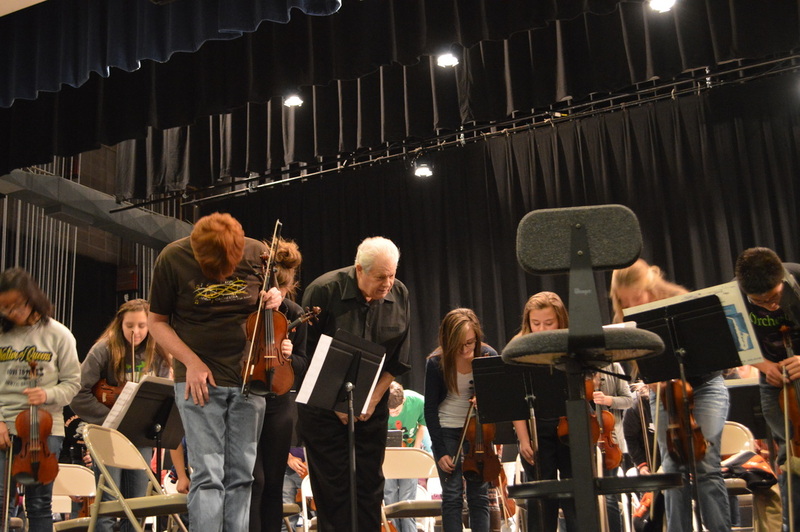 ​At the Performance, First and Foremost: Acknowledge your musicians! Not all conductors acknowledge their ensembles as much as they might. ; it’s our students who make the music not us with our batons. Just wave your baton and see if there’s any music. When the applause starts, do acknowledge your ensemble rather than bowing to the audience first. If you go off and come back on - and the musicians stomp or applaud you, bow first to them, then the audience. The message is: "My students: You're closest to my heart." Closer to the concert, practice playing it through - it’s a completely different experience than working on spots. We must work on spots, but problems usually emerge when you do play pieces all the way through. It’s like a manufacturer subjecting a product to stress to find out where the weak spots are...so they can be fixed. Do not stop, especially if the music starts falling apart; keep going. This gives students the chance to learn how to find their places and jump back in. If it’s really a mess, stop and ask where it got off...wait for the answers; in time, they’ll come. If none come, play it again; the same problems may not happen the second time 'round. Stage 4: Prepare for Next Rehearsal & Sharpen Assessment Skills: Create a "Last 8 Minutes Crew"
Create a crew (let the students come up with a name) to go out into the hall and take notes about what was good and what needs improvement. A few kids were snickering at "...all this formal stuff." Check sections that sit facing the conductor turn to the audience when they stand. Compliment them and don’t criticize. Let your compliment be the end of the rehearsal. Here is one of the powerful tools I know to increase rapport within the group and group identity: have everyone applaud (at the end of each and every rehearsal – even and especially non-L8M rehearsals. Increases your rapport with your students. Violinists, violists, winds and brass should put instruments down so they can applaud fully. No one should make polite applause, or go through the motions without making a sound (many are likely to pretend). Persist and persist – go around the room and, if it’s your style, look at their hands – if they’re not clapping enthusiastically, put your ear to their hands and then smile at them and model how to clap loud. Ask them to applaud politely. Then ask them to applaud enthusiastically. They'll be surprised at the difference and will learn a lot. Do this at each rehearsal and, little by little, it will become a “thing” that your ensemble will enjoy doing (some will not no matter what and you’ll just have to let them go; it’s not yet their time). Over time, many will join in as they overcome their shyness, lack of self-esteem, cultural conditioning, or whatever kept them for applauding enthusiastically. I have insisted on this “applause thing” and many times it has become so important to the musicians that they applauded so much that (of course they’ll exaggerate), but it because so popular that it built individual and ensemble spirit incredibly. To vary things, ask another teacher, or maintenance person, or assistant principal to come in and be the audience. Make sure s/he applauds at the right time! Also include playing and rest position. You have to teach this way before the concert. Decide how often to do the L8M; at the end of each rehearsal will dimish its effectiveness. Your students will soon run it, look forward to it as it becomes part of your ensemble culture. Starting performing at the end of a rehearsal right at the beginning starts to “tone” your ensemble from the beginning of the semester. Consider Inviting your Principal or Assistant Principal to visit your L8M Show! S/Hhe’s sure to be impressed by the unique way that you’ve chosen to keep your students engaged right up to the bell! You’ll be thrilled by the results, and so will your students! For sure, it's a lot, but great achievement requires great effort.